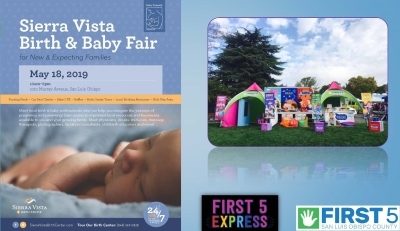 Sierra Vista's Birth & Baby Fair gives new moms and dads and young families the chance to navigate the journey of parenthood by providing access in one place-- for many different resource agencies and vendors in our county. In addition, First 5 California's Talk.Read.Sing. Express will be on site-- a fun and interactive exhibit with songs, stories, musical instruments and more-- all to promote early literacy and brain development! The event runs from 10am to 2pm.